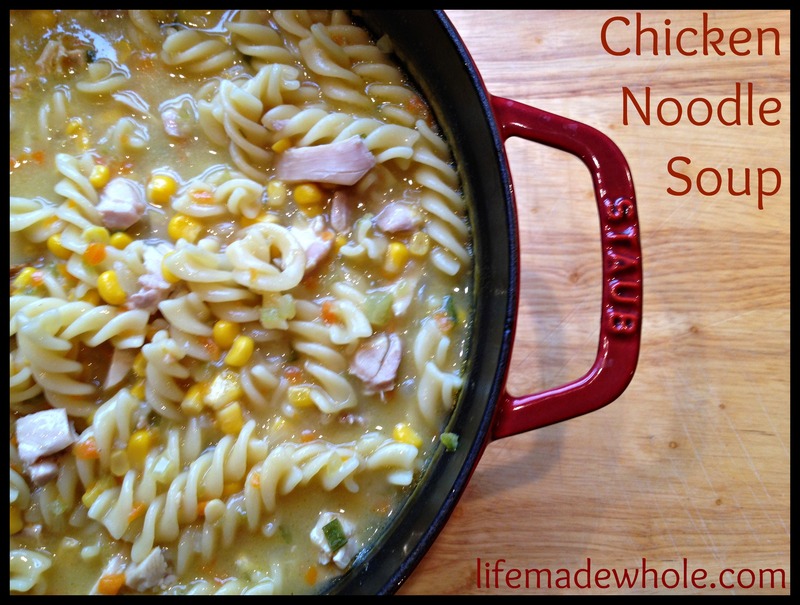 One Pot Chicken Noodle Soup! As much as I like to prepare excellent, nourishing food – I like it to be easy to prepare as well. I found this recipe and loved the fact that it was crock-pot based. I have made it in my crock-pot and I have made it in my dutch oven, depending on my schedule for the day. To make this in the crock pot, it is super simple. Place all the ingredients, except the noodles, but including the uncooked chicken thighs, into a crock pot and cook on low for 8 hours. About 1 hour before serving, shred the chicken (while in crock pot) and then add the noodles. Adjust crock pot to high and let cook for one hour, till noodles are ready. You can even put frozen chicken in the crock pot! To prepare in a dutch oven, add the veggies to the pot and saute’ over medium heat for about 5 minutes so they soften a bit. Add the remaining ingredients, bring to a boil and then reduce to a simmer and cook until chicken is cooked through and noodles are done. Turn heat down to low until you are ready to serve. I have made this both ways and it is delicious! Also, this makes pretty much so I sometimes freeze 1/2 for another meal. If the soup is too thick, feel free to add additional chicken stock or water to reach the desired consistency. This entry was posted in Food and tagged chicken, soup. Bookmark the permalink. 3 Responses to One Pot Chicken Noodle Soup! We’ll have to give it a try! YUM. Yes, especially if it is made with homemade chicken stock — definitely a pick-me-up for someone who is not feeling well. Enjoy! Oooooh, that’s true! Might have to take that one extra step to make it even better…great tip! Good luck, and we’ll let you know how the soup turns out!